The Victorian Government is supporting Aboriginal Victorians in finding work on Victoria’s major projects through its Training for the Future rail industry skills program. Through the program, delivered by the Level Crossing Removal Authority, the Victorian Government is giving university students facing barriers to finding work, including Aboriginal students, opportunities to undertake paid internships to gain experience working on rail projects. One student who’s undertaken a paid internship in archaeology is Leah Hunt, a Jadawadjali, Gunditj-mara and Wamba Wamba woman. After completing an internship over summer at Heritage Victoria, Leah is now working with the Mernda Rail Extension Project team to create a community display of historical artefacts found at Plenty Gorge Park. 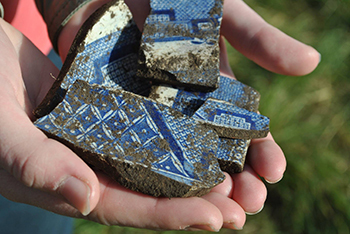 “Archaeology is an important job and one that should not be undertaken lightly…this is the future of my people and our culture, and it needs to be protected,” Leah said. “I have been working in the conservation lab, where I have been conserving artefacts, and cataloguing them. I have also been out working on an excavation site in the city, where I had the opportunity to excavate and wet sieve. As of February 2018, Aboriginal Victorians worked over 189,000 employment hours on the Level Crossing Removal projects, with $20 million invested into Aboriginal businesses and social enterprises. The Victorian Government is further supporting Aboriginal Victorians in finding work on Victoria’s major projects through its $68 million Jobs Victoria initiative. Jobs Victoria Partner RAW Recruitment has placed 120 Aboriginal jobseekers into employment since September 2016, including on the Level Crossing Removal projects and the Metro Tunnel projects. Find out more about the Jobs Victoria program and what it can provide employers and jobseekers via the Jobs Victoria website.